Decisions of the Takeovers Panel have called into question whether the “truth in takeovers” policy in ASIC Regulatory Guide 25 applies in the same way to substantial holders as it does to bidders and target companies. This article examines the rationale for the application of this policy to statements by each of these market participants. It then analyses the Panel decisions applying this policy to substantial shareholders, including the conflicting decisions in Finders Resources Ltd 02 and Finders Resources Ltd 03R. The article concludes that ASIC or the Panel needs to make it clear that the “truth in takeovers” policy should be applied to substantial holders in the same way as for the other market participants. The article examines the accounting and financial reporting of intangible assets held and reported by the S&P/ASX 100 listed entities on the Australian Securities Exchange (ASX) during 2016 and 2017. The different types of intangible assets that are disclosed and reported by the S&P/ASX 100 with a view of providing detailed information concerning the composition, type and nature of intangibles and intellectual property assets held by Australia’s top listed entities. The article provides further detail regarding the importance of intangible assets relative to total assets and market capitalisation of the S&P/ASX 100. Lastly, we examine the relative importance and composition of intangible assets for each sector of our sample of listed entities in the S&P/ASX 100. The article concludes with the finding that there is a positive reporting bias for externally acquired goodwill and a negative reporting bias for internally generated intangibles as assets, which are reported and disclosed by Australia’s top 100 listed entities. 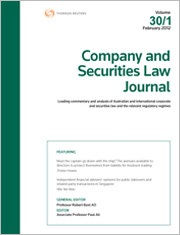 The authors undertake an empirical study of all cases brought by the Australian Securities and Investments Commission (ASIC) for breach of the duty to act with care and diligence during the period from 1993 to 2017 in order to assess the extent to which ASIC is changing governance standards through litigation. We find that ASIC has been ambitious in pushing the boundaries of s 180(1) and has established a contravention in 83% of cases brought, in a wide range of factual situations. There is a strong public interest focus in s 180(1) litigation, given that the main penalty sought by ASIC, and ordered by the courts, is disqualification from managing companies. The high success rate, combined with the wide range of factual scenarios in which ASIC has established a breach, indicates that ASIC has had a significant impact on governance standards applicable to company directors and officers. For the PDF version of the table of contents, click here: Westlaw AU – CSLJ Vol 36 No 6 Contents or here: Checkpoint – CSLJ Vol 36 No 6 Contents.